The huge New Life Church in Colorado Springs presents enthusiastic Praise & Worship that can only come straight from connection to the heart of God. Worship leader, Ross Parsley and a huge band and choir present great songs like, 'Breathe', 'You Are My King' and 'We Will Embrace Your Move'. 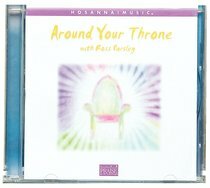 Customer Reviews For "Around Your Throne"
I've always loved Ross Parsley's albums, especially the worship songs, as they really help bring your heart to worship God. I love this album as the songs' theme are about Jesus, the Servant King. My favourite song is "You are My King", as this is a gospel song, and always reminds me of how much God loves me.